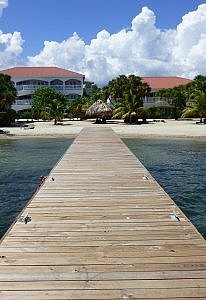 Belize Ocean Club straddles the narrow Placencia Peninsula of Belize, home to the country’s best beaches and a laid-back main village. It has a golden beach on one side with a pool, then a large lagoon with a mountain backdrop on the other side of the road. With a 5-star PADI dive shop on site, it’s also ready to take you underwater for scuba diving. 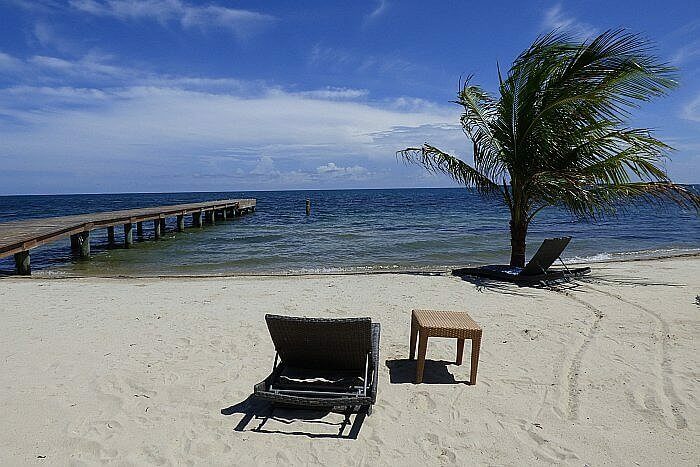 The small Central American country of Belize gets lots of visitors heading south to warm up and its extensive coral reef is a big draw for divers. You usually have to get out to the far-flung islands to find a nice beach, however. The main draw island of Ambergris Caye doesn’t exactly wow visitors with its beach scene. Placencia is a different story though. When you look down from the window of a domestic prop plane flight from Belize City coming in, there’s clearly a long beach extending from the tip all the way up the coast. You don’t have to contort yourself in just the right spot to get a good beach photo in this area. 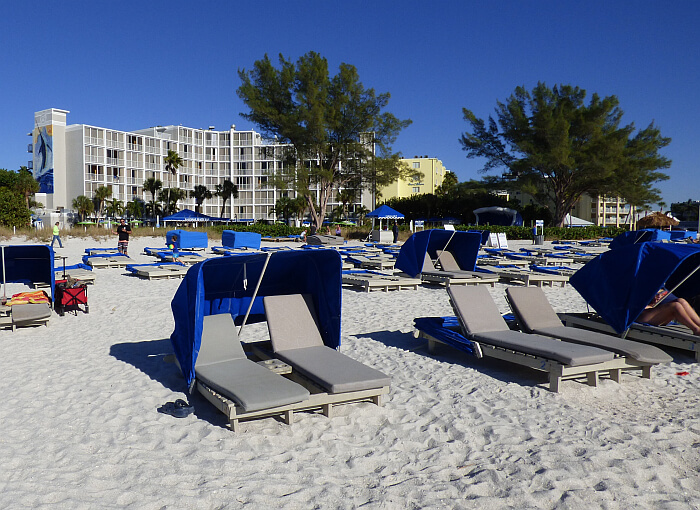 At any of the main resorts here you’ll be able to kick back in a lounge chair with your toes in the sand. This layout gives you plenty of room to spread out and not be on top of each other, plus if you have a family you can utilize the fold-out sofa or make it a two-bedroom suite instead. The units are stocked with basic glasses and dishes, but you can request what you need in terms of kitchen utensils. Bedrooms and baths are equipped like a luxury hotel, with fine linens and towels, good toiletries, and comfortable beds. Wi-Fi works better in some rooms than others, but gets higher in speed the closer your are to a main building. Your view choices are good from either set of buildings. 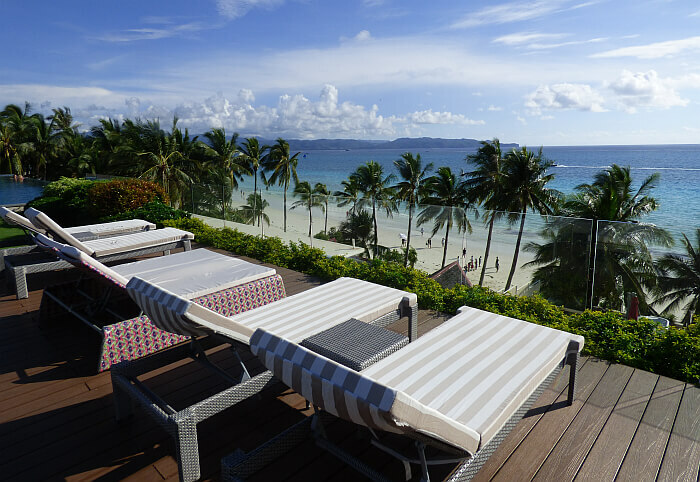 One set faces the pool and beach, the other faces the lagoon for sunsets and is closer to the main restaurant and bar. 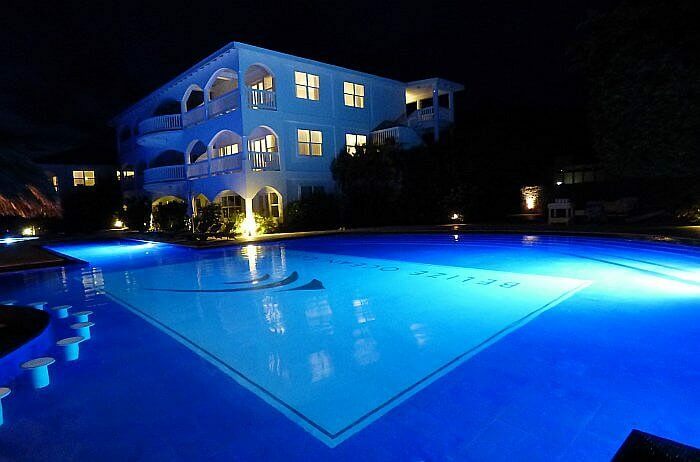 The swimming pool at Belize Ocean Club is long enough for laps, with different depths and a swim-up bar. There are lounge chairs around the pool and on the beach, plus a covered palapa area where you can order lunch in the shade. Waves lapping the shore here are only ankle height, so this is a good place to let small children play in the sea. Food served here at the 16 Degrees Restaurant is quite good by often disappointing Central American standards, overseen by a chef who has clearly studied the craft. You can get upscale versions of Belizean classics, enjoy some fresh seafood prepared with flair, or get your standard international favorites. They try to utilize local ingredients and flavors and have a small organic garden on site. The bar at the pool is joined by a larger one in the main building, which is filled with polished local hardwoods and has a view of the lagoon and mountains through walls of glass. There are a few other restaurants a walk, bike, or short ride down the road and a daily free shuttle to Placencia village 15-20 minutes away. Airport pickups are generally included in the rates if you’re not arriving by car. Staffers can arrange all kinds of excursions on the water, including fishing and snorkeling, or you can head the other direction. Inland there are Mayan ruins, jungles to explore, and caves to go tubing through. Rates start at around $140 in low season before taxes and a mandatory service fee, maxing out at about $750 for the best “penthouse” ocean view 2BR suite in high season. 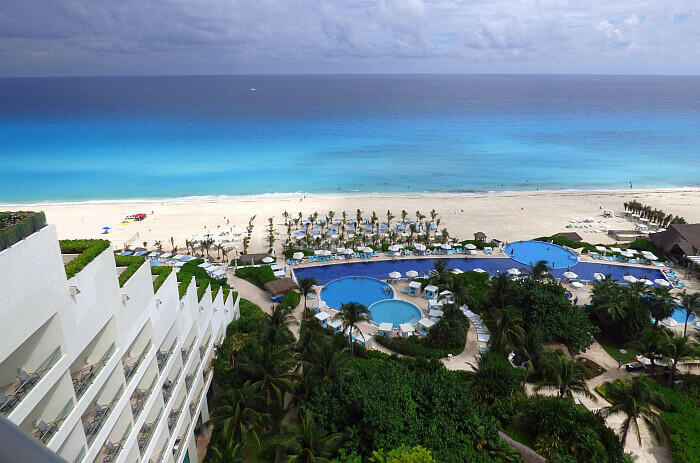 Check their package deals page for specials or see prices elsewhere at Expedia or Hotels.com. 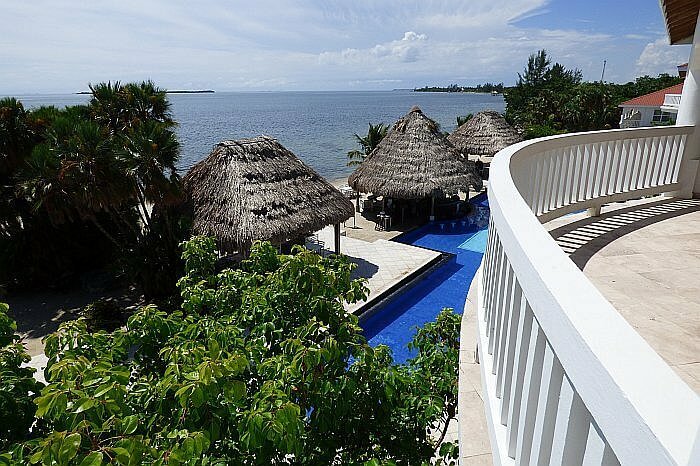 Review by editor Tim Leffel, who was hosted at Belize Ocean Club while writing a feature story for another publication. 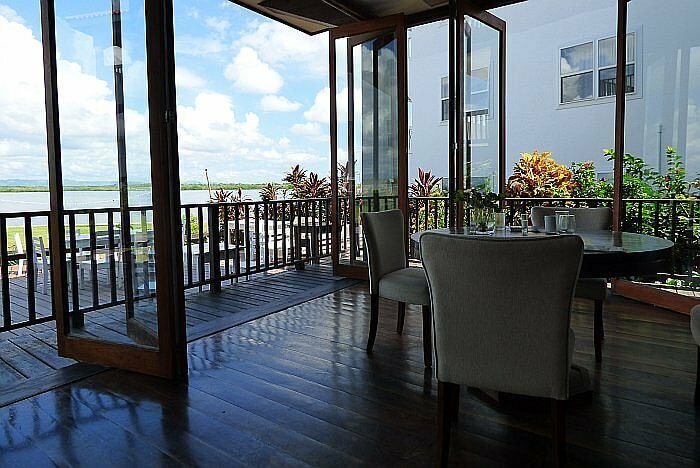 Photos by the author, video tour courtesy of Luxury Latin America Belize.